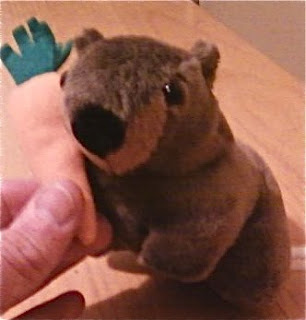 a wombat- i can easily cut the carrot of. no worries, it is yours. Blacky wanted the swan too and asked me about the same time you posted for it... so i was gonna make you guys polish my bell end to see who got it. 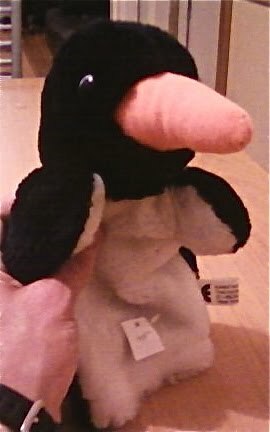 That penguin's nose does look very Suss! Nospmas, did you want me to make it for you with the penguin (the way you've written that it sounds like you want to do it yourself; either way i'm ok... it is my task today while im a gimp at home to get all of the jox done. Hope you're on the recovery Stoph! I can't believe you're stitching furry animals when doing post-op! the secret seven are back together for the hols. Hope Paul can bring Timmy the dog. That's right, Paul is in on the adventure and will be wearing a wombat under his kilt! Right decent of him really. Just talking Blyton style so any pom's out there will know what is coming their way. How does one give the finger to Selectors? DTW dream team comp for Ashes anyone?